Book: This collection showcases direct mailers that exhibit outstanding sales impact and quality design. 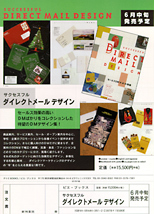 The book emphasizes how successful direct mail design is a communication tool that speaks directly to the target customer. Work featured: The Skoubo Graphics direct mail package included in this book markets illustrations. The mailer never loses the handcrafted quality of the illustrations, while providing a fully digitized approach that allows customization of each promotion. All original artwork was digitized, catalogued and printed on individual cards. Each packet was then customized for the publisher with styles and subjects of interest to them. The folded card envelope, based on a Japanese paper-folding design, makes a unique presentation. 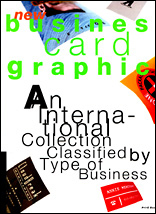 Book: Covering a broad spectrum of business categories, this selection of the worlds best business cards range from the trendiest to the classiest. The book considers the questions of how design elements can be distilled to fit into small spaces, and how the characteristics of business card design vary between countries. Work featured: The Skoubo Graphics works included in this publication are business cards for a World Music band named Short Term Memory. The design integrates contemporary typography with ancient symbols. In the background artwork, lighting effects help to blend these elements and create an atmosphere of mystery. 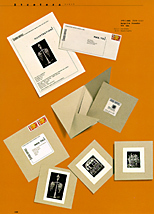 At the time of this project, digital four-color printing was still relatively new. Its use in this case allowed greater flexibility in design and cost effectiveness. Because no film was needed, a larger design area could be used at no additional cost. This allowed each band member to select two different business card designs. 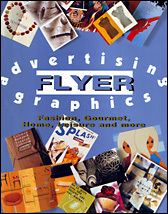 Book: Featuring promotional flyers, this book illustrates how eye-catching flyers have become a popular and well-used advertising medium. The flyers selected for this collection represent a wide range of businesses and applications. Work featured: The Skoubo Graphics work included in this publication is an illustrated poem titled The Mirror. This graphic flyer uses typography to convey the momentum and ideas expressed in the creative writing. The typography and illustration are unified as part of one design communicating to the reader a strong and powerful message.